I’m so excited for the book events I have coming up! 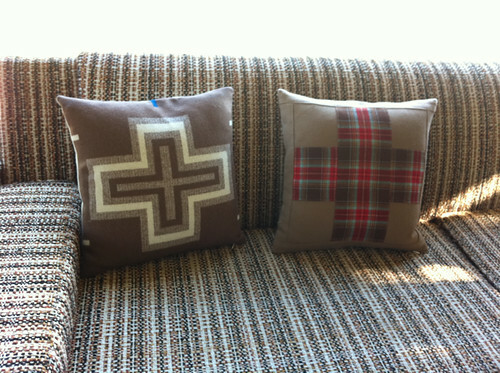 I’m teaching my Woolen Cross Pillow class at the Woolen Mill Store on Saturday, August 20, from 12-2. It’s $45 and you get all the materials to make one of these cross pillows, plus lots of extra wool to bring home for your second one! I’ll be teaching an heirloom wool baby quilt class representing Pendleton on Saturday at 8:30 am. Lots more information on this one coming soon. 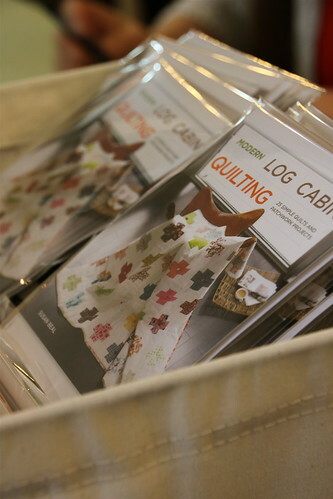 Come by Modern Domestic, check out the book and lots of the projects, and stitch up a log cabin block with a little kit I’ve made for everyone! There will be refreshments and sewing machines, what more can you ask for? Afterwards, there will be an open sew night from 6-9 pm so you can work on any of your own projects you’d like. Come to Powell’s for a fun crafty afternoon the next day, too! I’ll bring a bunch of the book projects in to show, plus treats for everyone, and send you home with a log cabin block kit for good measure. I love Powell’s and their Sunday afternoon craft book events have been so much fun lately. 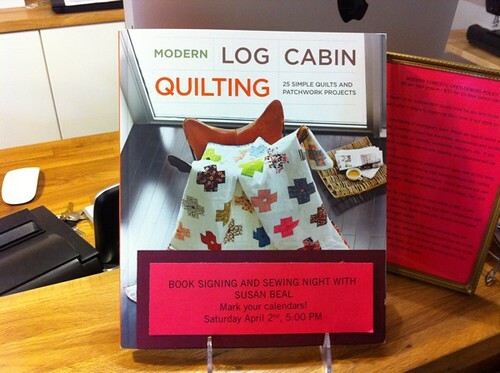 Thanks to everyone who came to Powell’s and Modern Domestic for the lovely weekend of book parties! I wrote up a photo post about them right here if you’re interested. 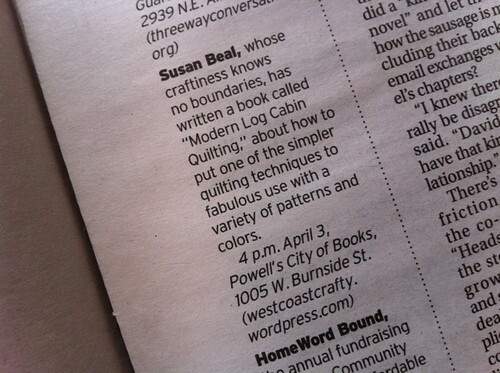 Thursday, April 7: the Modern Quilt Show at PNCA, presented by the Portland Modern Quilt Guild! I’m so thrilled that my Anniversary Quilt will be part of this lovely group show. food and drinks and quilts! 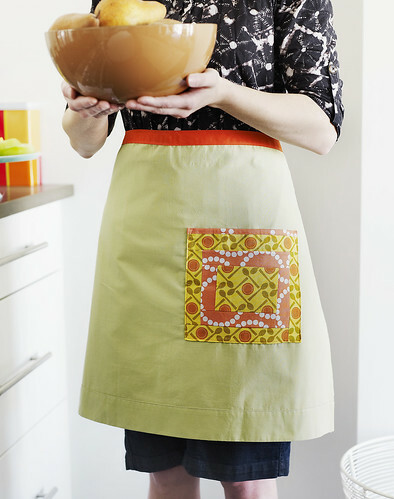 In this beginner-friendly class, turn a favorite pillowcase into an adorable sashed apron with a simple and gorgeous log cabin block pocket. This is a great way to experiment with piecing and construction, and you’ll leave with a finished project for good measure – in your choice of a streamlined modern or delicately gathered vintage style. We’ll be making our quilt blocks, constructing lined pockets, stitching up aprons and adding the sashes on lovely, sleek Bernina 440QEs. Sewing with these sleek machines is super fun. Register and get more information right over here. $45. I’ll be showing photographs of antique, vintage and modern log cabin quilts and talking about the amazing range of versatility this pattern offers, plus showing some of my own quilts and patchwork projects. 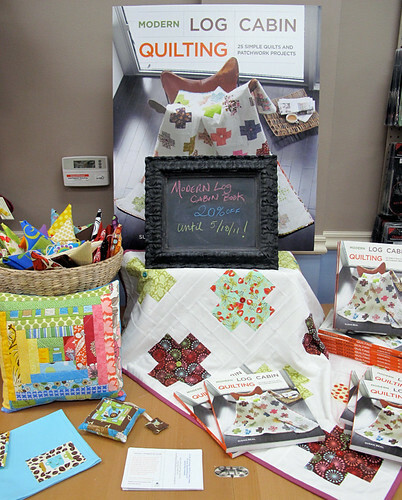 Meetings are amazing and fun, and there will also a chance to win copies of my book and special log cabin fabric packs (among many other great sewing and quilting prizes). Free! 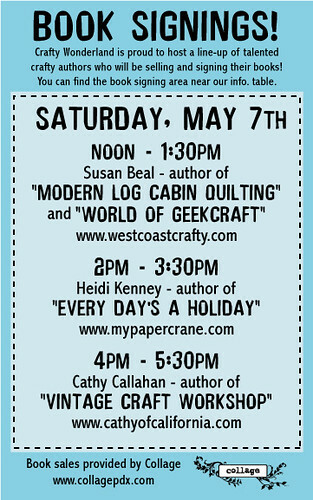 Saturday, May 7: Crafty Wonderland! Mark your calendars for Portland’s largest and most awesome crafty sale, 11-6 pm at the Oregon Convention Center. I’ll be signing books and shopping for handmade treasures! I’m on first from noon to 1:30, with free quilt block kits for anyone who buys or brings a copy of the book, then superstars Heidi Kenney and Cathy Callahan will be signing their books too! My first out-of-town event, I’m really excited! We’ll have refreshments and sew log cabin blocks from my kits (featuring Bobbin’s Nest fabrics hand-picked by my friend Amy). I can’t believe all the great book projects Amy and her co-workers have already sewn – awesome. Saturday, July 9: my Modern Crosses quilt will be part of a special Portland Modern Quilt Guild exhibit at the Sisters Outdoor Quilt Show! So thrilled about this one. I went to Sisters in 2009 for the first time and even met some of the Quilters of Gee’s Bend. I never dreamed one of my quilts would be on display there too! 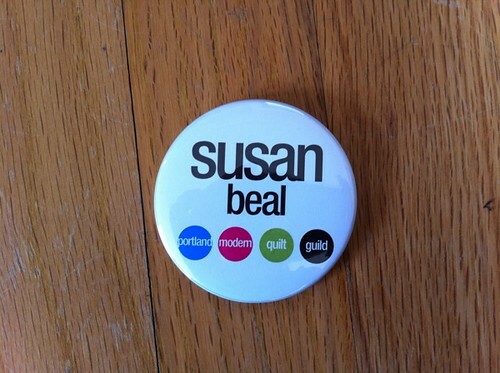 Several of us in PMQG will be there for the day and we would love it if you can stop by our exhibit to say hi! This two-day workshop introduces students to Log Cabin quilting and the many ways to work with this ultra-versatile pattern. We will explore the history and applications which make this uniquely American style still relevant today, and study antique, vintage and modern log cabin quilts for inspiration. Students will create their own original quilt blocks, perfect for quilts or smaller patchwork projects. This class will focus on color, balance, arrangements and intuitive design when choosing fabrics and arranging completed blocks, and is suitable for both beginners with some sewing experience and more experienced quilters who would like to focus more deeply on this medium. Two full days, from 10-4 each day for plenty of design, cutting, piecing and quilting time. $195 + $50 department fee. Get more information and register right over here.